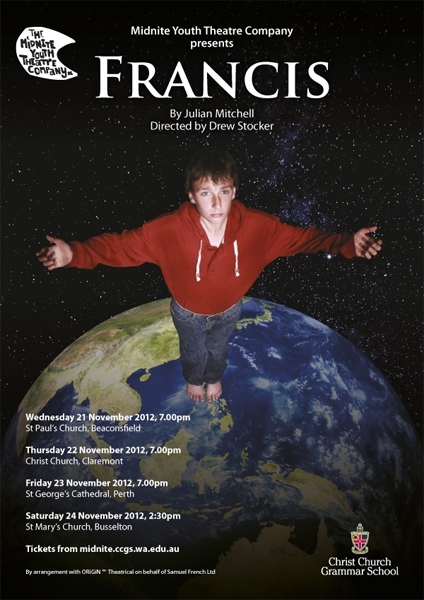 Program notes for the play Francis, presented by the Midnite Youth Theatre Company, November 21, 22, 23 and 24, by Julian Mitchell and directed by Drew Stocker tssf. Saint Francis of Assisi became a leader by giving power away. Francis Bernadone was born in 1181 or 1182 and grew up in a wealthy merchant’s house. As a teenager, he became a leader of wild parties through the streets of Assisi. He was known as ‘The King of the Revels’, and used his money to attract friends. Like all young men in Assisi, Francis chose to join in the little wars the town fought – for the Emperor (against the Pope) and against the neighbouring hill-town of Perugia. After one battle Francis was taken prisoner in a dark prison in Perugia. Having a wealthy father meant that he was held for ransom. It took a year to negotiate a price for his release. He began to realise that even with money he couldn’t have what he wanted when he wanted. After his release he bought a knighthood to fight in the crusades. Instead of a glorious tour in Palestine, Francis returned home sick. In a vision God showed him that he didn’t want him to be a knight, so he gave away his lavish armour. Everywhere around him, Francis could see people fighting: fighting to keep their possessions and power. Assisi had always been a barter economy, but now, as Francis grew to manhood, it was becoming a greedy money economy. Instead of giving each other life’s necessities, the people of Assisi began to amass cash. The division between the privileged and the poor grew rapidly. Francis saw a solution to this greed. All people should treat each other as members of their family. Instead of grabbing resources for themselves, they should share with their brothers and sisters what they had. Francis started a community of those who would follow this way. He dreamed of a new world where people gave everything away to each other, so all would be equally rich. Francis struggled for the rest of his life to find the best way to be the leader of this community. His idea of a leader was someone who did not have power over others. Like Jesus, Francis wanted to be the leader in serving others, a servant leader, a leader in giving power away. The concept was – and is – difficult to put into practice, but the communities Francis founded continue to try to make it work. Maybe – he drove his Brothers mad with his insisting that he obey them!